In the works for some time now has been a caster friendly crankbait to add to our line-up of custom lures. 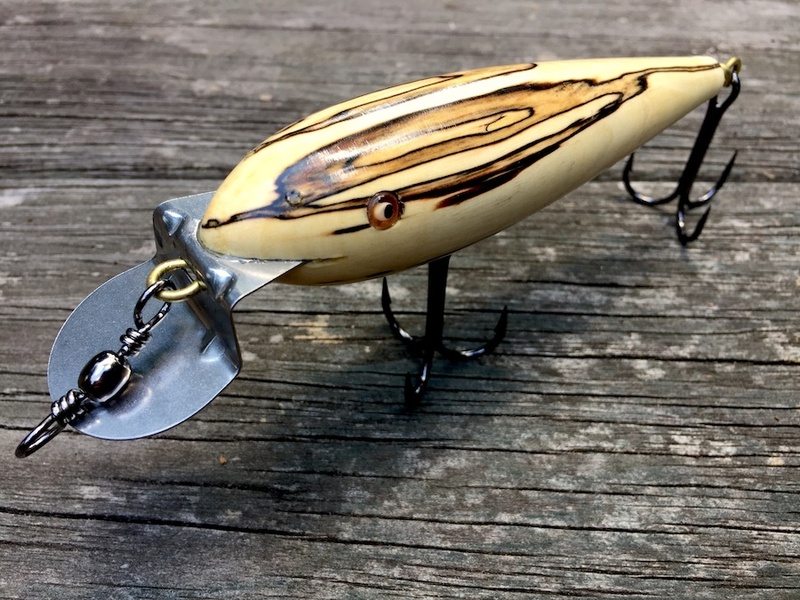 This prototype bait measures a little over the six inch mark and will hopefully be offered in a variety of wood types, as well as a jointed model. 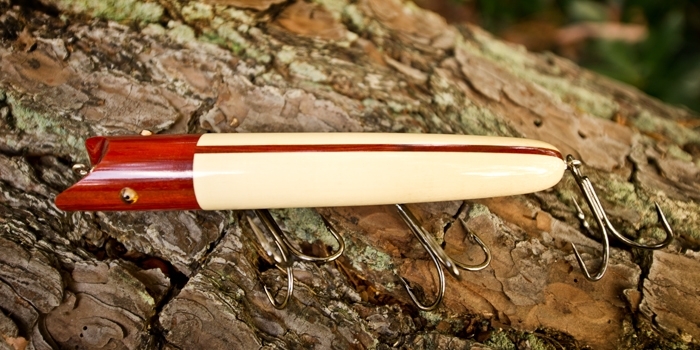 This particular lure was done in spalted maple offering a unique vivid contrasting lure. Testing will begin this Sunday in Wisconsin, and hopefully the next time you see it it will be covered in teeth marks. I have been testing all four of the lures shown in the photos and I must say I am very pleased. 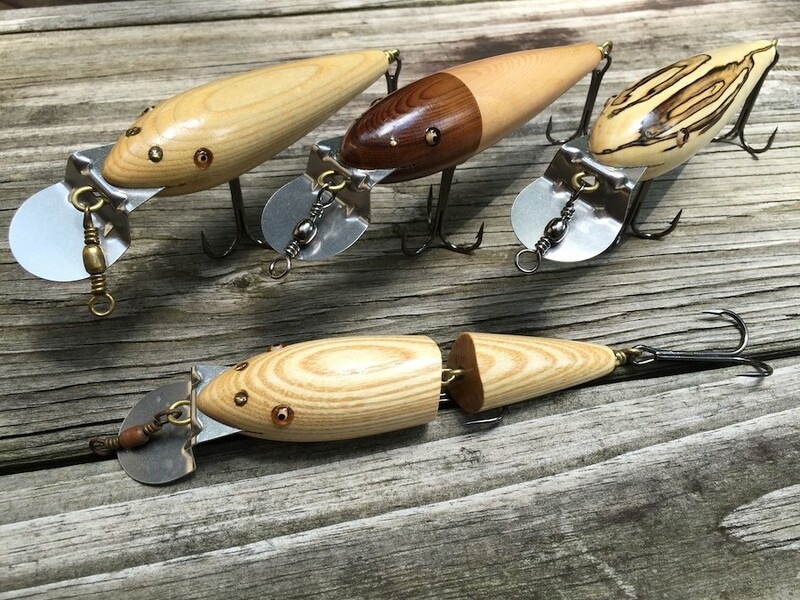 Interestingly, the use of different species of wood allows us to determine the buoyancy of each lure. 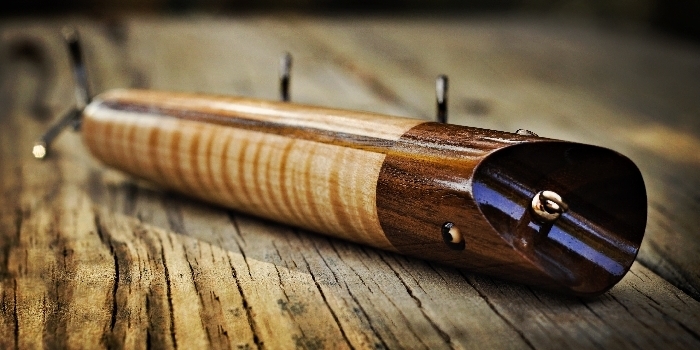 For example, using solid ash, the lure will sink allowing the angler to count it down to a desired depth. The other side of the coin is the cedar combination which is very buoyant making it very lively. When cranking and stopping it will pop back to the surface readily well suited for fishing over shallow weed beds. All track true even at slower trolling speeds and achieve depths between 8 and 10 feet. The lures will soon be available under the lure tab of the website, please stay tuned. 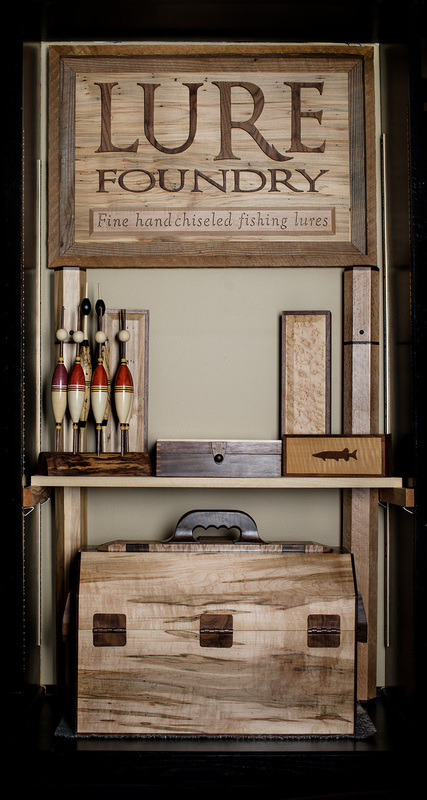 We have finally gotten around to expanding our tackle box lineup to include a total of three offerings thus far. This is a sneak peek at the mid-sized box that will be fully unveiled on the upcoming fishing trip in a couple of weeks. 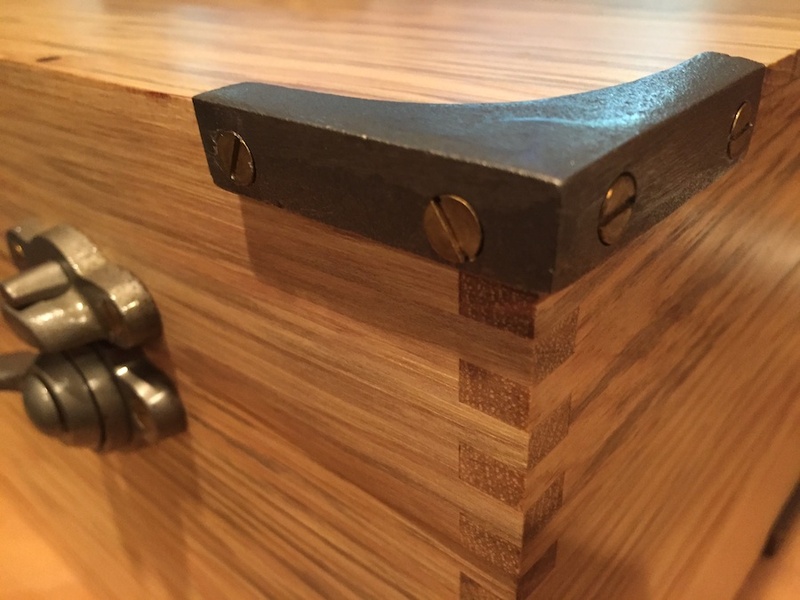 As you can see one of the many features will include solid cast iron hardware. Check back in to see a full series of pic’s on this one! I have had this Tackle Box in use for five days now and I must say I love it. Just the right size to hold a moderate selection of my favorite baits, and accessories. Additionally, for a wooden box, it is surprisingly light given its bullet proof construction. No doubt this box will create a sense of “pride of ownership” for the next wood be client. This box will soon be featured under the Tackle Box tab on the website showing all of its features. Tight Lines! How do you celebrate a milestone birthday with a good friend who has everything? 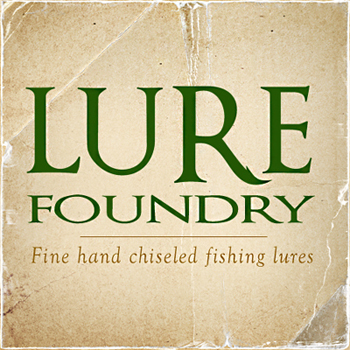 Simple, you have the Lure Foundry fabricate the ultimate “Gentleman’s Long Trip Tackle Box”. This box has a few upgraded features from the original. 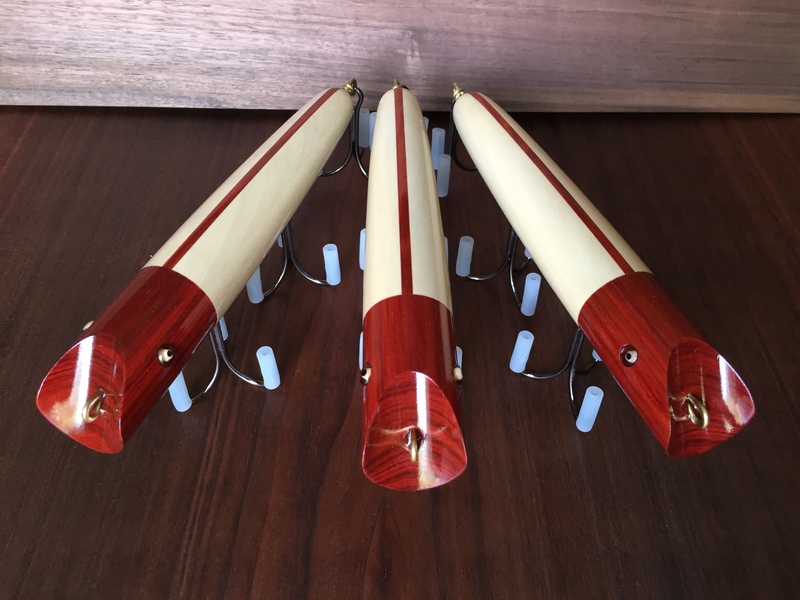 They include larger barrel’s on the hinges, a new hidden clasp arrangement on the top plate, and the striking swept post offset handle in figured walnut and curly maple. 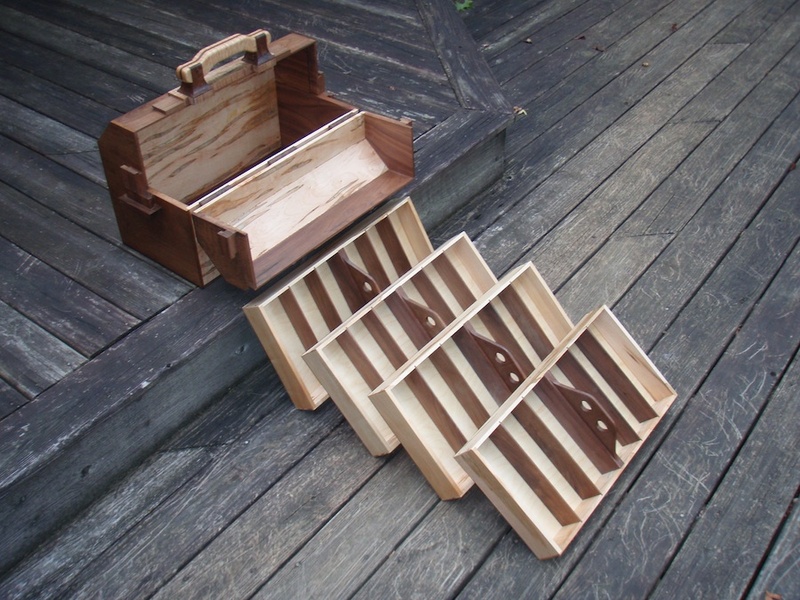 Additionally we used ambrosia maple for the trays, and black walnut for the tray lifts and ribs. 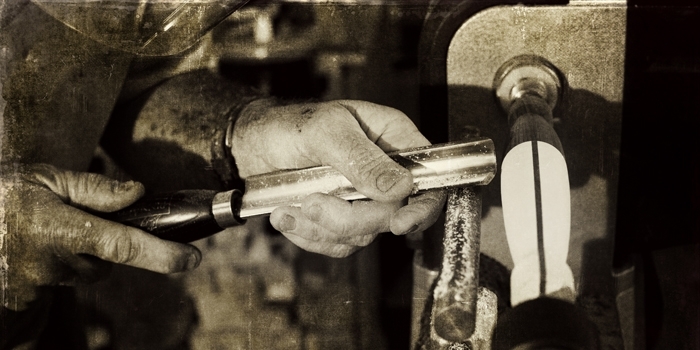 The particulars include a two month search for the top plate material alone, 193 individually hand crafted parts, and over 100 hours of fabrication and finish time. Almost wish I could keep it for myself. Earlier this season I was contacted to donate one of my lures to the Penn/Jersey Muskies Incorporated 50 Chapter, MI50. 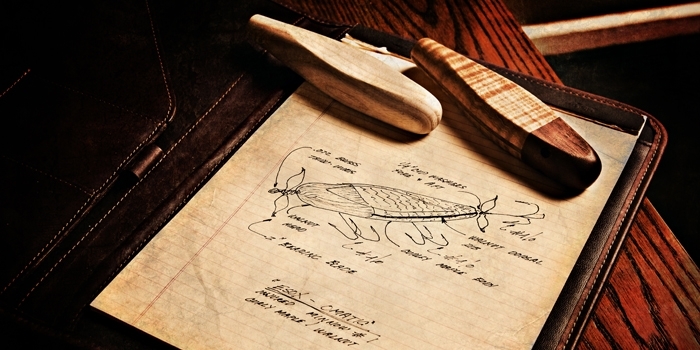 The annual MI50 spring auction supporting musky fishing in Eastern PA is currently open. This fundraiser will run from April 27th to May 7th, 2015. 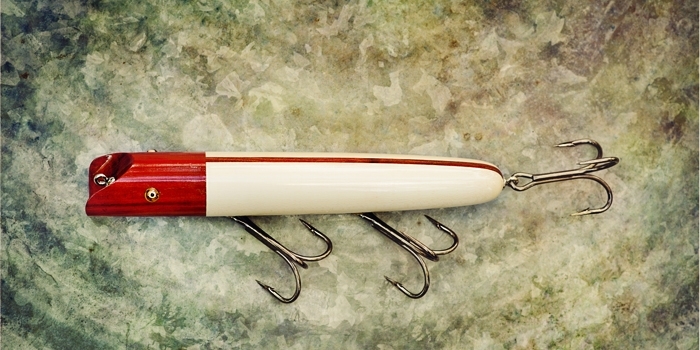 The lure on the left currently resides in this auction and is featured on their front page of the website MI50.com. They have done an extraordinary job in marketing this piece and has received a lot of attention. Proud to be supporting this group! Occaisionaly we get surprised by a customer that wants to do something special for a colleague of theirs. 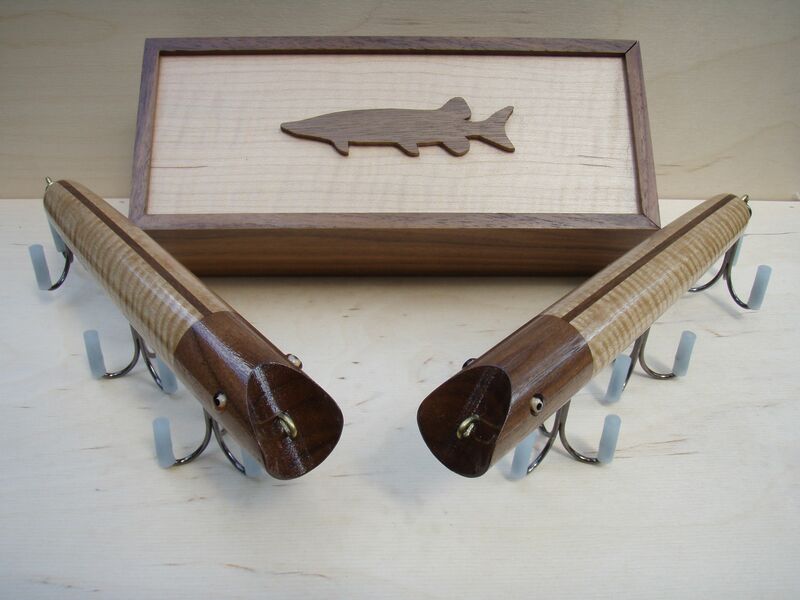 This matched pair in Walnut and Curly Maple went to an avid fisherman and retiring physician from OHIO. 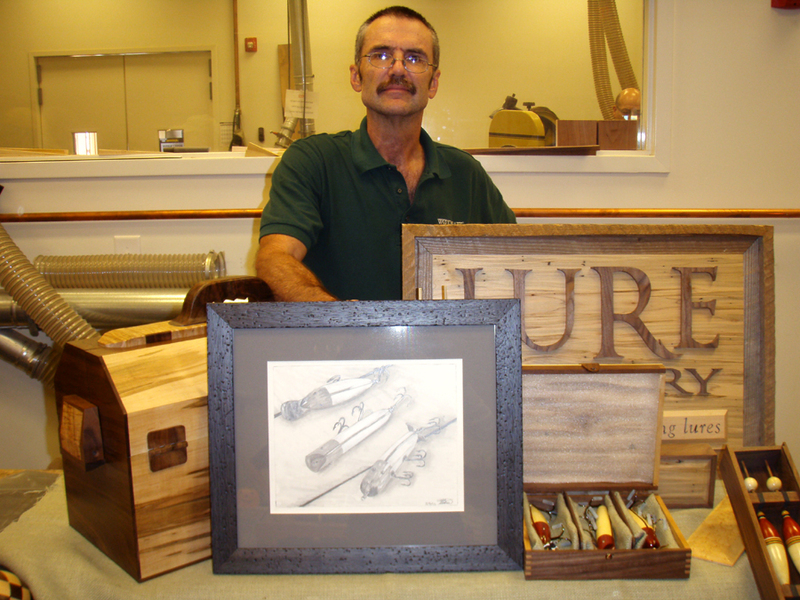 The following photos were taken at the Fall Woodworking Extravaganza at Woodcraft Atlanta held recently. We were one of the featured presenters there and got a lot of attention and great feedback from many of our peers. 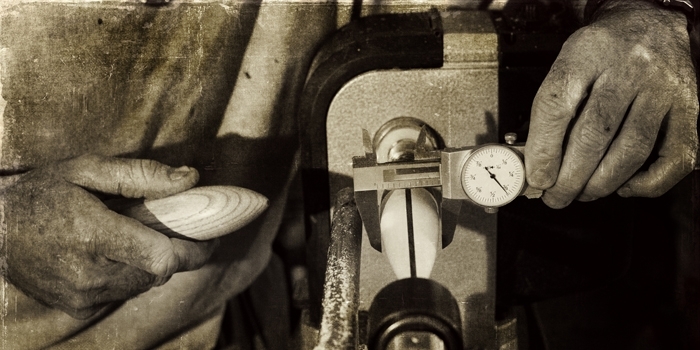 This show included many of Georgia’s local talents to include woodturners, carvers, period piece furniture makers, novelty pieces and more. 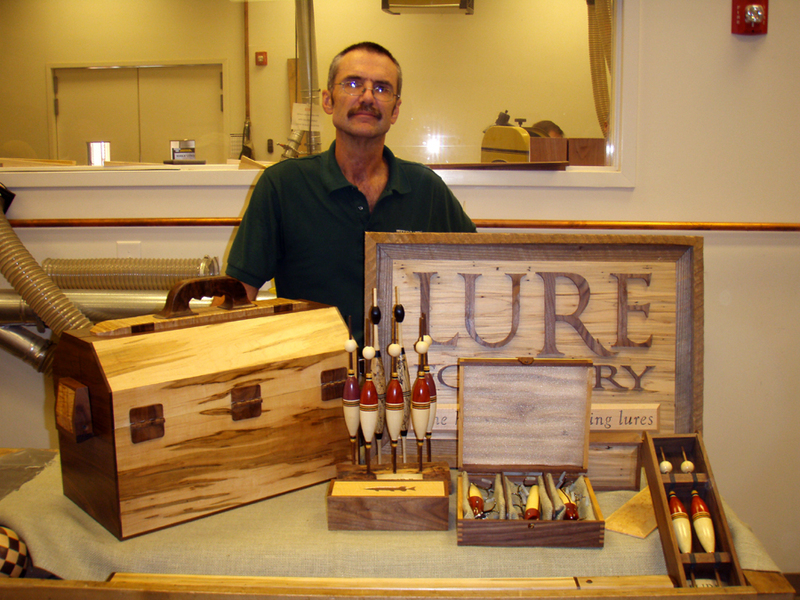 I was thrilled to be included with so many talented artisans and want to say thanks to all who stopped by our station. Please note that the second photo includes a framed original of the Grand Slam done by world renowned sketch artist Eilish Nobes. I was proud to have this original work on display there! 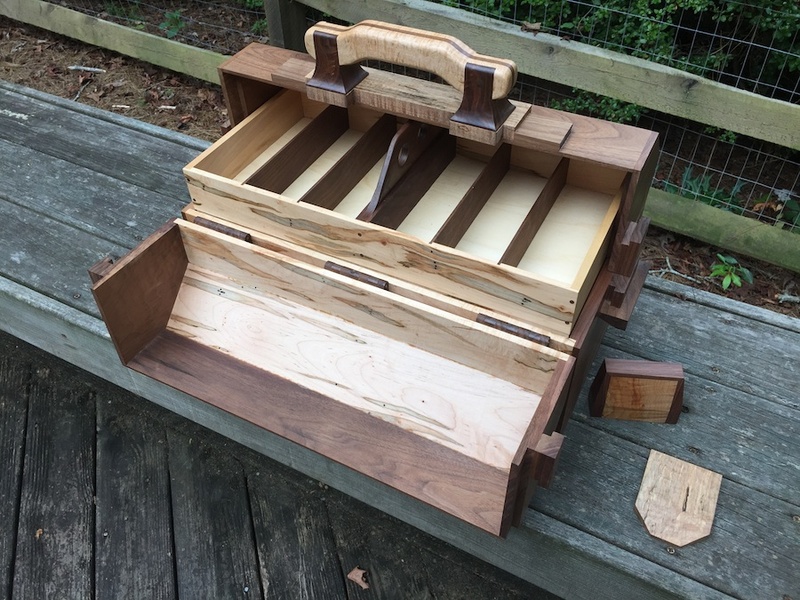 Don’t miss it, the weekend extravaganza at Woodcraft Atlanta where we were requested to be one of the featured presenters there. The photo depicts the studio arrangement of our craft which will be on display at the event. We will be available there all day Saturday the 27th to discuss the design and construction of lures, tackle boxes, rod cases and more. 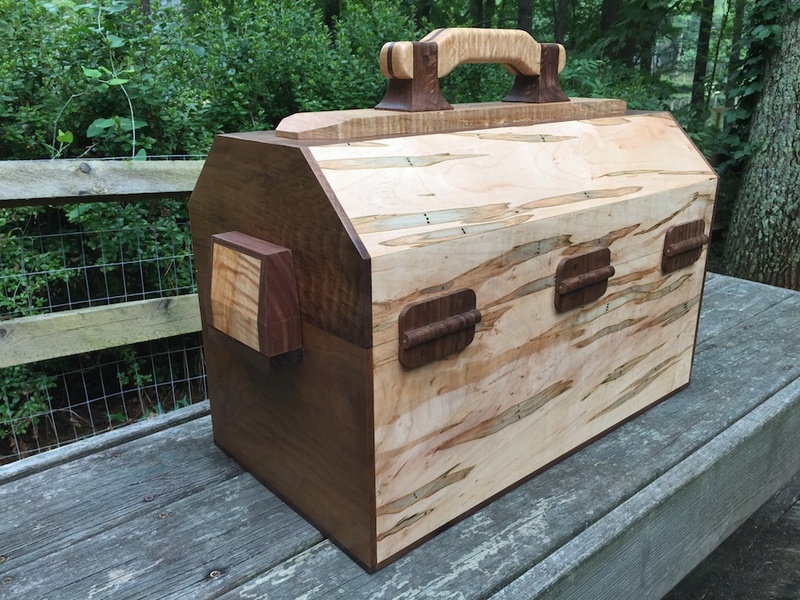 Stop by Woodcraft Atlanta, 8560 Holcomb Bridge Road, Alpharetta GA 30022 for a look and grab some lunch while you are there. We look forward to seeing you! 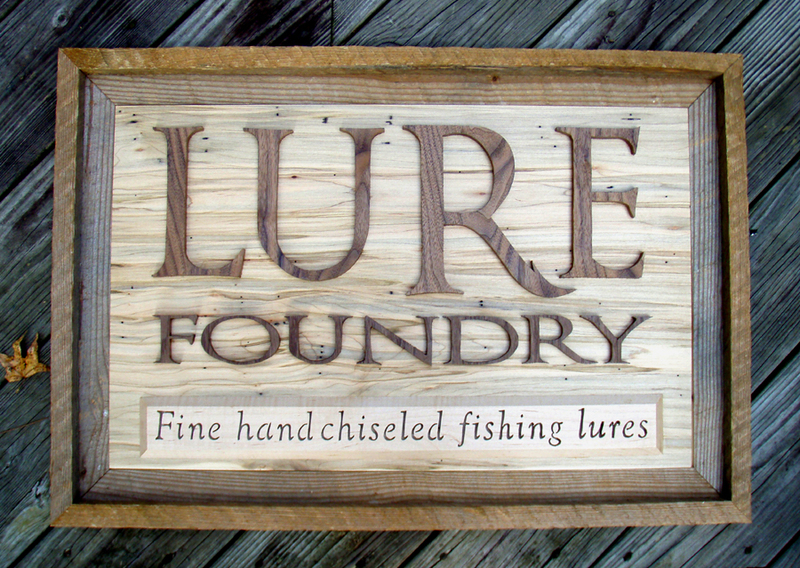 The official Lure Foundry Sign was completed a few days ago and I am very happy with the way it turned out. I used four types of domestic woods taken from cutoffs from my backstock in the shop. They include Weathered rough cut White Pine for the frame, Ambrosia Maple for the back panel, Black Walnut for the raised lettering, and soft maple for the slogo at the bottom. 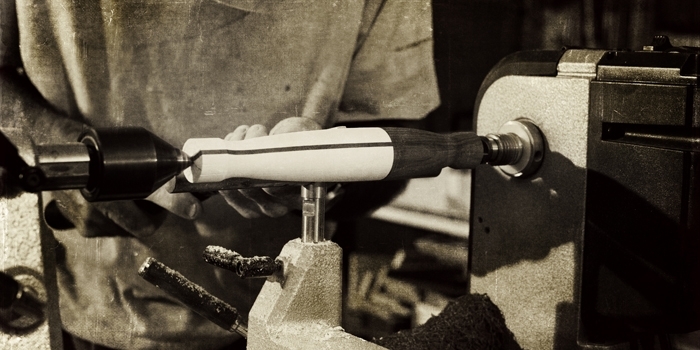 All of the lettering you see was cut out using one of my favorite machines the scroll saw. I expect it will age gracefully as I continue to add additional oil based topcoats. When not traveling to shows or events this sign will be hung as part of a display in the studio. This project has been on the back burner for some time and as the requests come in for us to attend shows and events I knew I had to get it done. 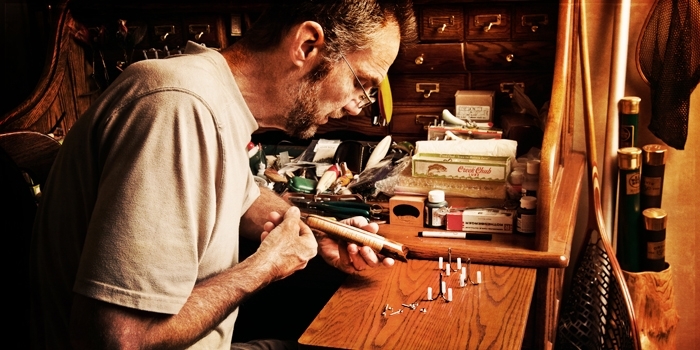 The photo shows the cutting of my Slogo, “Fine hand chiseled fishing lures”, in a maple plate using the scroll saw. This plate will form the bottom portion of a sign that will look much like the logo you see in the header of the website. 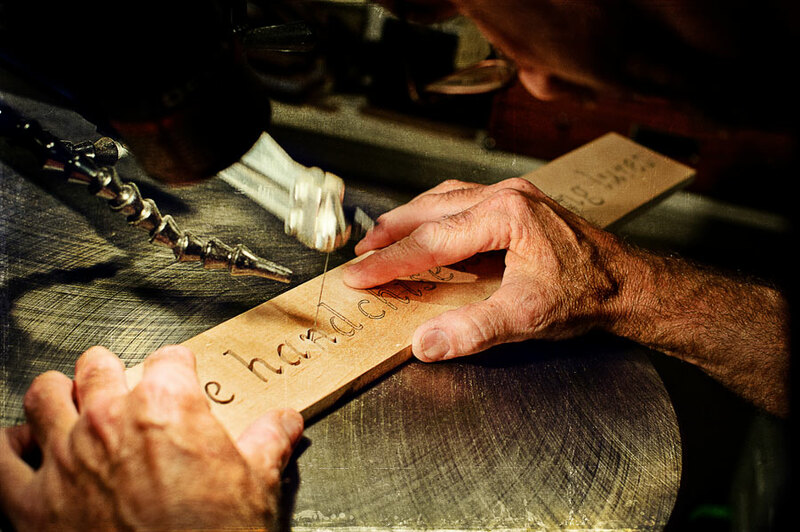 This sign will be made entirely of domestic complimentary woods including a rustic frame. More on this to follow. Our stay in Wisconsin not only included the finest in accommodations, it also provided excellent backdrops for some of our catalog shoots. Equipment included both current and vintage model outboard motors. 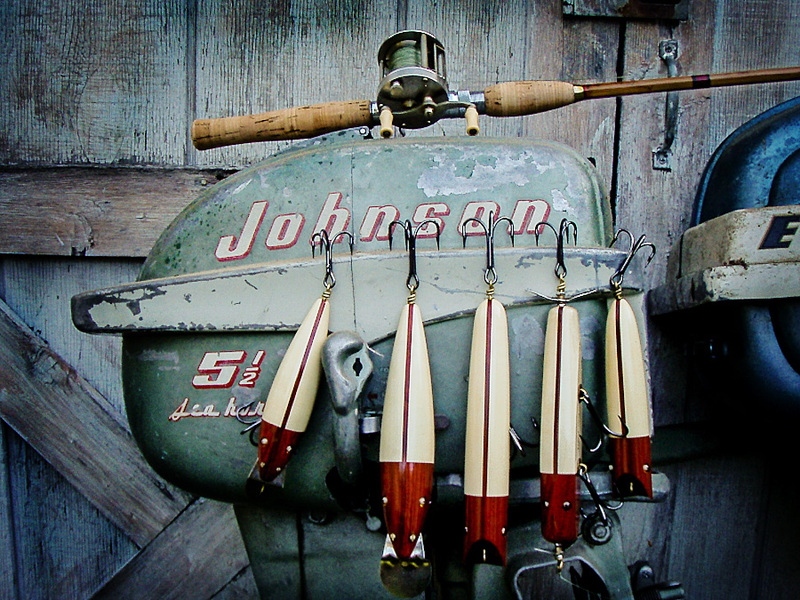 For this shot we chose a 1960’s model 5 1/2 hp Johnson Sea Horse to hang a collection of Lure Foundry lures. 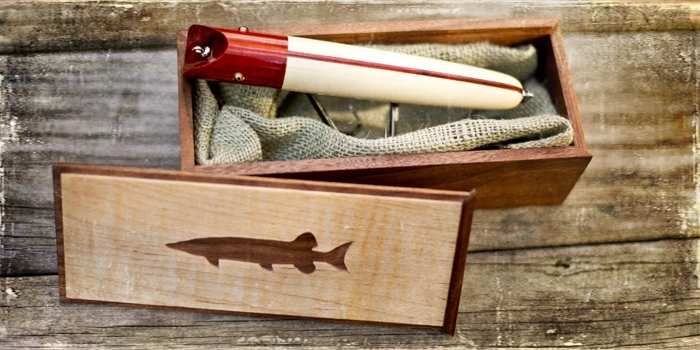 We also included a vintage Heddon bamboo musky rod to top off the package, photographed in front of the old tool shed. It is said that this outboard is still in fine running condition. I think you would agree that this photo can spark a few fishing memories of the past.